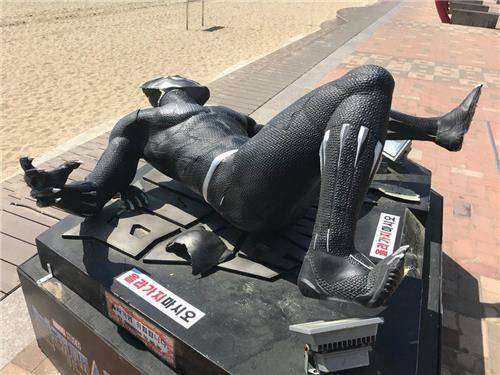 Following the vandalism of a “Black Panther” sculpture at Gwangbok-ro in March, another statue of the Black Panther superhero in Busan near Gwangalli Beach was found toppled over with its head damaged. 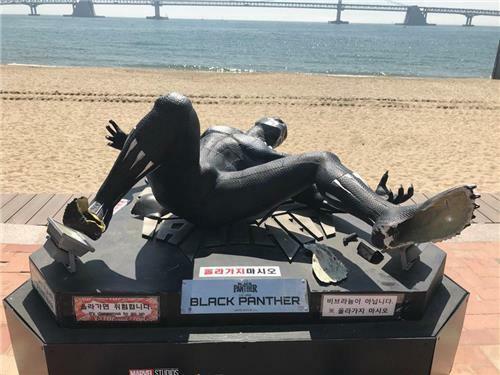 The Walt Disney Co. had initially sent a pair of Black Panther sculptures to be displayed in Busan, one in Gwangbok-ro and one along Gwangalli Beach, to commemorate the first time for Marvel Studios to shoot at the southern coastal city of Korea. Another statue was erected in front of the CGV theater at Centum City, home to the Busan International Film Festival. The statue near Gwangalli Beach was damaged at approximately 5 a.m. Saturday, according to the Korea Film Council on Sunday. It was discovered fallen on its back with part of its rear head broken off. Police said they are going through security footage to catch the suspect who vandalized the statue. The 32-year-old intoxicated man who vandalized the first Black Panther statue in Gwangbok-ro on March 17 was booked without detention in early April. A film council official believes the latest suspect had climbed atop the statue, as the official voiced dismay over the incident despite numerous off-limits signs.